One definite idea I have for Finely Ground is that I would like to do a monthly or quarterly digest of all things seasonal. Whatever evokes the mood of this month, this season. I never realized how important seasons are to me until I moved to the south. When it's 70 degrees in December everything just feels out of sync and disorienting! 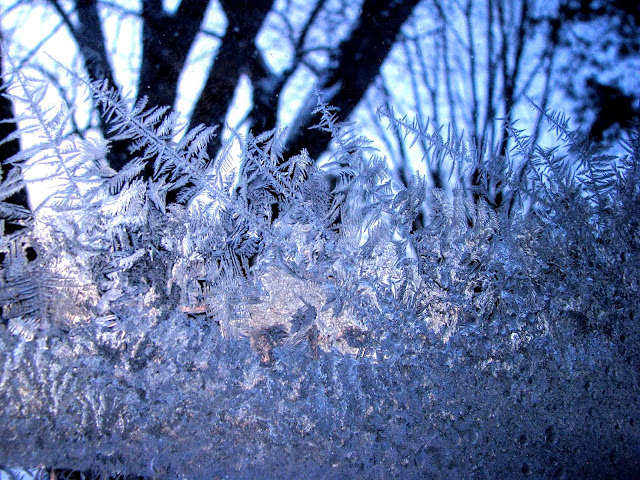 So I have been absolutely relishing that this winter seems colder than usual for the region. There was even a "Once-In-100-Years" snowfall in mid-December. Maybe I'll try to structure these digests by the five senses. We'll see how that goes. Instagram addict in the house! Lately, I have been into all things Scandinavian, and am following some delightful Swedish Instagram accounts: @piasundgrenstorm, @underbaraclaras, @nordingarden, @annikasnaturligating, @villasmedsbo, @plathuset All the snow, and the slant of January light. . . . Also, it seems that the Scandinavian Instagram accounts I'm following are erupting now with hyacinths and tulips--this is totally my January mood, too! As soon as Christmas is past bring on the green growing things. One other note -- Instagram's new "follow hashtags" feature. Check out the #auroraborealis hashtag! Seeing the Northern Lights someday is just about at the top of my bucket list, and I have been loving the daily influx of snowy pines and dancing lights in the sky that this hashtag brings to my feed. 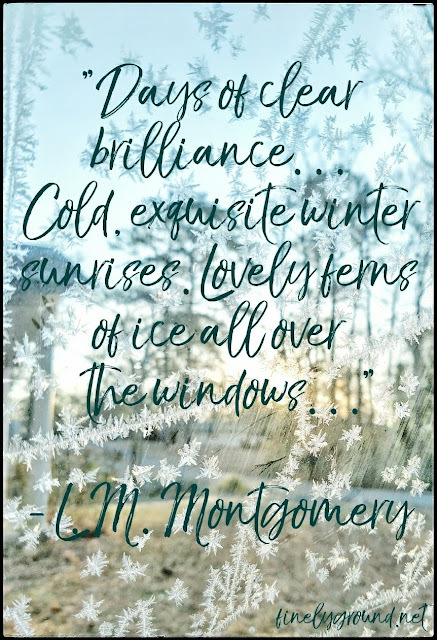 Some January sounds, to me, are the glassy clatter of icicles falling off the roof--the squeaky crunch of snow underfoot--the crackle of a cozy fire -- and maybe even the hum of my laptop's fan as I ramp up the productivity. ;) If you mash that all together with some daffodils and determination, I guess you'll get something like this Winter Playlist I've put together for you on Spotify! I sliced into a grapefruit the other day and it was heavenly. I think half the joy of citrus fruits is the smell -- especially in the cold of winter. Hmm. This five senses thing is a little harder than I thought it would be. Just wait until they come up with "scratch and sniff" touchscreen devices. In the meantime, join me in appreciating blood oranges and grapefruit. What's your favorite citrus? P.s. Speaking of grapefruit, I once shared my recipe for candied grapefruit peel on the blog. Still love it! One of my grandmothers passed away in December, and she has left a legacy of hand knit and crocheted objects. I'm drawn to crocheting and other handcrafts because of the colors, but she said once that it was the texture and feeling of the yarn in her hands that she enjoyed. We have blankets and pot holders and scarves left to warm our hearts along with memories. So on that note, my "touch" for January is yarn and crafting supplies and all things cozy. I have done a few hot pads with her pattern recently, but I'm also working on a rag rug at the moment! 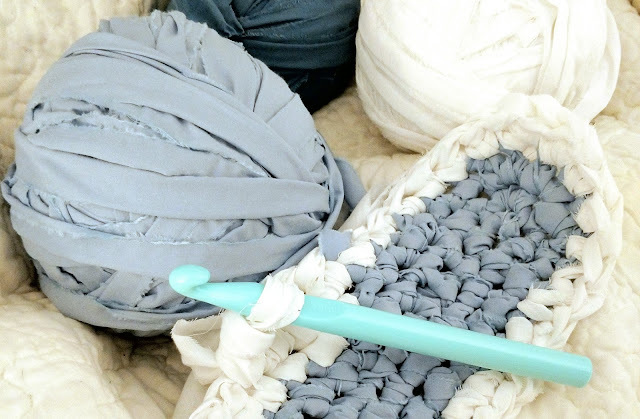 Tutorial in the works, but in the mean time, here's some Rag Rug inspiration from Pinterest. Maybe it's the Scandinavian kick I've been on, but salmon and dill seem to me to be the tastes of January. Pan Seared Salmon with Leeks is on my to-do list -- I have some leeks leftover from a potato and leek soup! Recently, we also enjoyed this Scandinavian Salmon Casserole and some Swedish Rice Pudding. Leeks, Citrus, Salmon, Dill....What are your January tastebuds clamoring for? 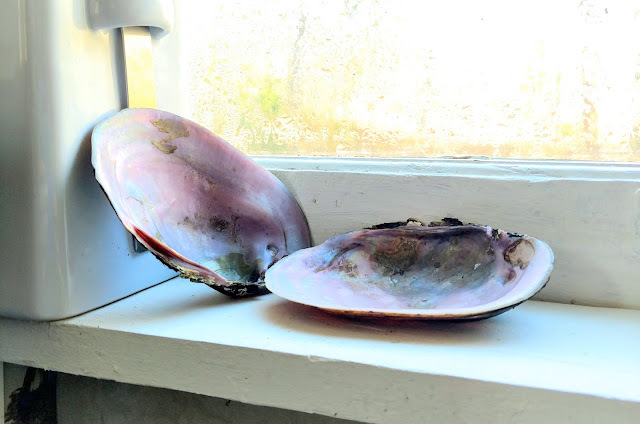 Josh scavenged these pearly purple shells from a nearby river last fall. I love that they're on trend, now, per Pantone's color of the year!